See also Scumm Letter G Fix by Armageddon104, LucasArts SCUMM - Solid by Goatmeal. Info: Created on 5th June 2010 . Last edited on 25th May 2012. I was always intrigued by how well this typeface worked in the game: very clean and easy to read. I remember this one from The Secret of Monkey Island, especially during the insult swordfights. Good work! Though I've never played the Monkey Island series (more of a Sierra man, myself), I knew that this font was used in other LucasArts games from the early-to-mid '90s. And Monkey Island 1 & 2 have recently been upgraded and re-released; during gameplay, you can even change between the upgraded version and the classic version to see what's new (or what's old)! I heard about that. I'd play it only on the classic mode though. You can't beat its backgrounds and close-ups in all their 256 colour beauty. P.S. I also loved Sierra games, especially the Space Quest series. The readability of this font is great! Thanks for recreating a classic video game font, Goatmeal! You are most welcome, Sahwar, and thank you for the compliment! And you are correct: the outline style certainly stands out much better than a solid version would. 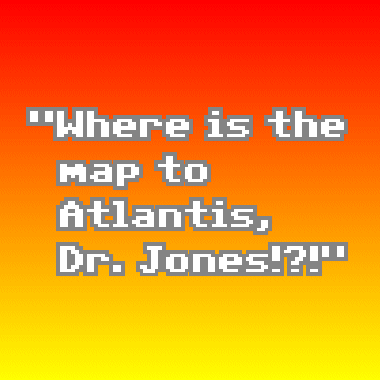 It certainly caught my eye years ago while playing "Indiana Jones and the Fate of Atlantis". Thanks to Armageddon104, the letter "g" has been corrected.